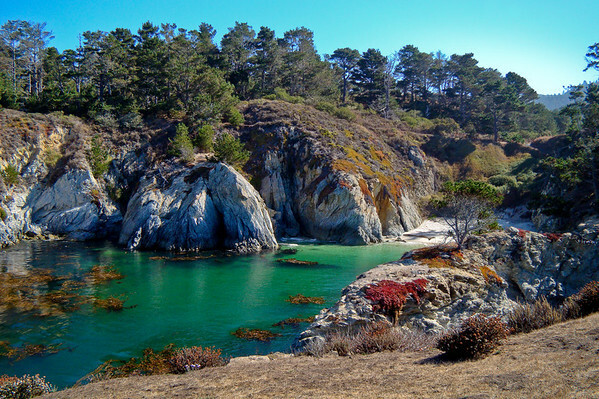 There is no such thing as a bad day at Point Lobos…not even a bad day for photography. When I got there on this year’s visit, the fog was already blowing over the point, and was actually quite heavy at Cypress Grove. Still the scene had its charm. Compositionally this is a challenging shot. 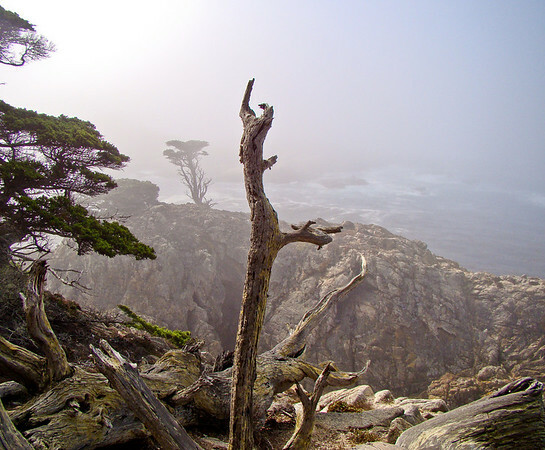 Normally I would not have put the upright tree trunk so near center, but it was necessary to put the fog bound tree on the offshore rock where I wanted it…at the power point (rule of thirds). The result is that the eye is drawn past the upright trunk out into the fog to the tree on the rock…which is what I was after. Only then, after exploring the details in the fog, does the eye come back to the strong shapes in the foreground. Works for me. How about you? Sony DSC H50 at 31mm equivalent. F5.6 @ 1/500 @ ISO 100. Programed auto. Cropped slightly from the right in Lightroom for composition. Recovery for the fog (brings out the inner light), added Clarity and Vibrance in the Presence panel, Sharpen landscape preset. I walked a section of the south trail this year that I had somehow missed last year, and one of the rewards was Hidden Beach. Just down a short set of steps (nothing like the China Beach or Gibson Beach runs), it is a pebble beach deep in one of the coves…a little hidden gem. Sony DSC H50 at 31mm equivalent. F5.6 @ 1/640 @ ISO 100. Programed auto. Recovery in Lightroom for the sky and rock highlights. A bit of Fill Light for the shadows. Blackpoint slightly right. Added Vibrance and Clarity in the Presence panel and Sharpen landscape preset. 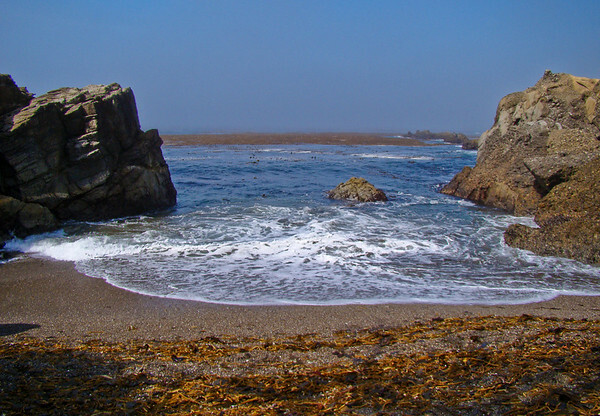 Okay…so yesterday I spent 4 hours back at Point Lobos. I stopped on the way down for some wildlife shots with the new PhotoScope, so it was 10:30 by the time I got there and the fog was already rolling across the point. Still, there is no such thing as a bad day at Point Lobos. It is just too scenic…too photogenic. The fog offshore and showing at any distance, certainly closing the horizons, was off set by the bright sun where it got through, lighting the foreground of shots and creating a somewhat more intimate feeling. And, as a bonus, they have repaired the stairway down into China Cove to China Beach. This area was closed last year when I visited, so, of course, I climbed down. I have several keepers from beach level. This one, with the variety of shades and colors in the water, the fog visible against the blue sky, the stark cliffs, and the red and green vegetation, captures at least one essence, new to me, of China Cove. Sony DSC H50 at 31mm equivalent. F5.6 @ 1/400 @ ISO 100. Programed auto. Recovery in Lightroom to bring up detail in the fog blanket and darken the sky. A bit of Fill Light for the cliff shadows. Added Clarity and Vibrance brought up the texture, and especially the colors in the water. Sharpen landscape preset. My first experiment in RAW (DNG) processing in Lightroom. This is an image from the new Zeiss PhotoScope, a spotting scope with an integrated 7mp camera. It has the option to record directly in DNG. The owl was a gift. 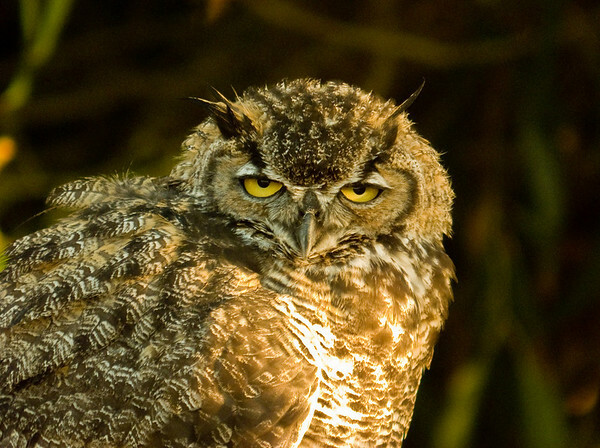 I walked up under it’s tree and took a series of images, then climbed the dune at Pajaro Dunes in Watsonville, CA…which put me right at eyelevel with the owl. I had lots of time to experiment with different camera settings. Zeiss PhotoScope at 1800mm equivalent. F5.6 (approximate) @ 1/35 @ ISO 100. In Lightroom, after separating the DNG file from it JPEG mate, I chose the “cloudy” preset for color balance and then made it just a bit cooler. Recovery for the highlights, and then additonal highlight modification in the Levels sliders. Blackpoint well to the right. Added Clarity and Vibrance. Sharpen landscape preset with added Detail. Noise Reduction for both Luminance and Color. 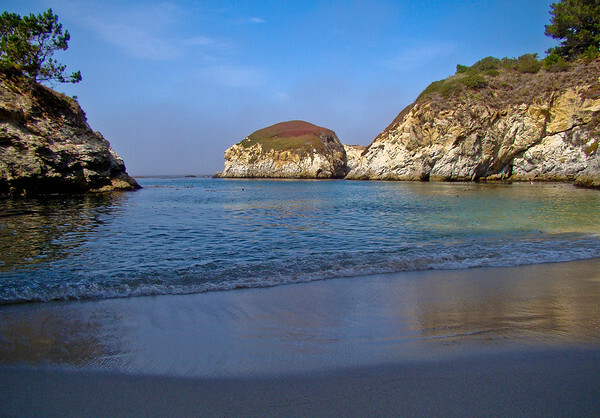 China Cove at Point Lobos, CA. That water is so green. The white cliffs. The blue sky. A classic scene. This is still from my morning there a year ago. It is on my list of possibles to revisit this Sunday, weather permitting. Sony DSC H50 at 31mm equivalent. F5.0 @ 1/250 @ ISO 100. Programmed auto. This shot required significant Recovery in Lightroom for the sky and the highlights on the white rocks. I applied some Fill Light to open the shadows, but then slid the blackpoint to the right to maintain saturation. Added Clarity and Vibrance in the Presence panel. Sharpen landscape preset. 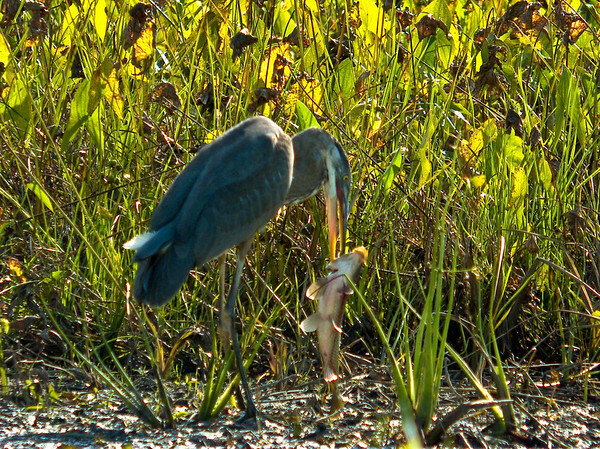 Immature Great Blue Heron with a Great Big Fish at Ottawa National Wildlife Refuge in Ohio. I wanted to catch the heron with the fish lifted its full length off the ground (it could not lift it any higher than it is in this image), and the new Zeiss PhotoScope made it possible. The bird is a hundred yards or more across a pond, with a good deal of heat motion in the air, so I am pretty happy with these results. Zeiss Photoscope at 1800mm (35mm equivalent). F5.7 @ 1/150 @ ISO 100. Programmed auto. Blackpoint to the right in Lightroom. Added Clarity and just a bit of Vibrance. Sharpen landscapes preset. I should say that the imaging software in the PhotoScope is still under active development…though near final (we hope). The product is not yet on the market…due in late October. This clip which shows more of the action of the GBHeron and GBFish was taken with a small Sanyo HD camcorder hand-held behind the eyepiece of the PhotoScope. Another from last year at this time. 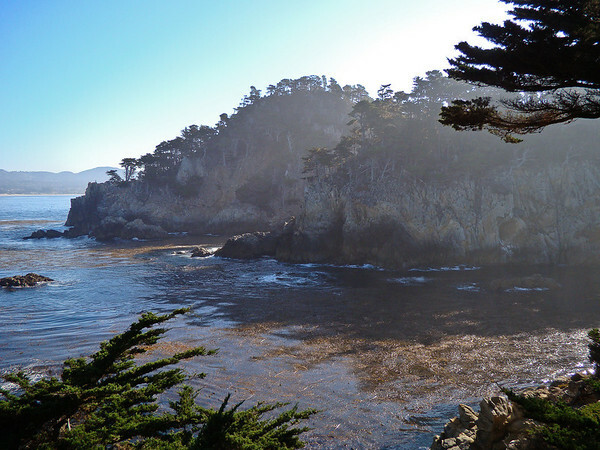 Point Lobos, CA. Perhaps the most scenic stretch of coast in the world…or at least the most photographed. Here the misty fog over the water lends an etherial look to the land/seascape. Foreground branches frame a bit. Recovery in Lightroom for the sky and mist (Recovery works magic with mist…bringing out the lights within). Added Clarity and Vibrance in the Presence panel. Sharpen Landscape preset.